The most challenging part of the open house is when your real estate agent schedules one three days from now and your home looks like a hoarder’s nest. A messy home can directly impact anything from whether or not a potential buyer will make an offer to the amount of their offer. Rare is the buyer who can see past disarray. Kicking off this process in the bathroom is highly recommended because it’s usually the smallest room of the house and therefore easiest to clean. From here start by picking up clothes, cleaning and detailing the vanity/sink area, out any and all expired personal care products. Declutter the shower/bathtub area, move toiletries to the cabinets or toss empty bottles into the recycling bin. Fold towels and place on hooks or towel bars. Clean it out. You know what to do: Spray shower/bath with a cleaning product, clean mirror, clean vanity, clean floor, and most importantly, clean the toilet. Like the bathroom, you’ll be surprised to find that much of what’s cluttering up your bedroom is “Easy Stuff.” Think books on your nightstand, rogue tissues, clothes that should be in your closet, and any random towels that were carelessly tossed aside during your hurried morning routine. Though your closet is here, that’s a separate zone to tackle next. Toss clothes in laundry baskets, or fold and put back in the bureau. Round up all the clothes that are on the floor and place in a laundry basket. A lot of decorative stuff can end up in the bedroom, covering bureaus and nightstands. This makes the room feel more cluttered than decorated, meaning you can likely donate anything you don’t have a strong attachment to. Finish with dusting surfaces and blinds, cleaning windows, vacuuming, and laundry. Chances are, the “floordrobe” clothes are more casual items that can be washed together. Otherwise, take a few extra minutes to separate lights from darks, and then launder accordingly. Most of us have more clothes than we can manage, making it the top source of clutter. The main challenge here is getting rid of old, outdated stuff. Donate all clothes that don’t fit and freebies you’ve never worn. Again, start with the easy decisions, like those promotional tees from events and jeans that haven’t fit since college. Bills, magazines, coats that don’t fit in the closet–the living room and dining room are both areas ripe for attracting clutter. It is easy to get attached to things that we don’t need and once you start thinking about the history behind the item, your guilt can lead to hours of indecision. If you find yourself stuck, pick up an under-the-bed storage box and temporarily house these sentimental odds-and-ends until there’s a little more time to go through everything. Tidy up the bookcases. This one’s relatively easy, involving little more than straightening rows and returning books to their shelves. If you have time, take 15 minutes to “weed” the old, outdated books off your shelf and into a donation bag. It’s a daily disaster zone — one minute it’s clean, the next the counters are barely visible. How does this happen? No one knows. Since it’s a daily struggle, it’s best to leave this room towards the end. Toss the inedibles. Start with the fridge/freezer; then move on to cabinets and pantry, throwing out anything gross or mysterious. Spend a maximum of 15 minutes per shelf (including time spent for cleaning any old spills). Clear the counters. This will generally mean trash and misplaced items, but it also means that tin of coffee and even appliances. These spaces have one thing in common: paper clutter. There shouldn’t be piles of unsorted papers in the first place, says Mellen. Pick up a pile and get ruthless. “W2s are not the same as old greeting cards. Keep the returns, toss the W2s. Greeting cards with nothing more than a scribble in them have done their job — someone was thinking of you at a particular time and let you know it. 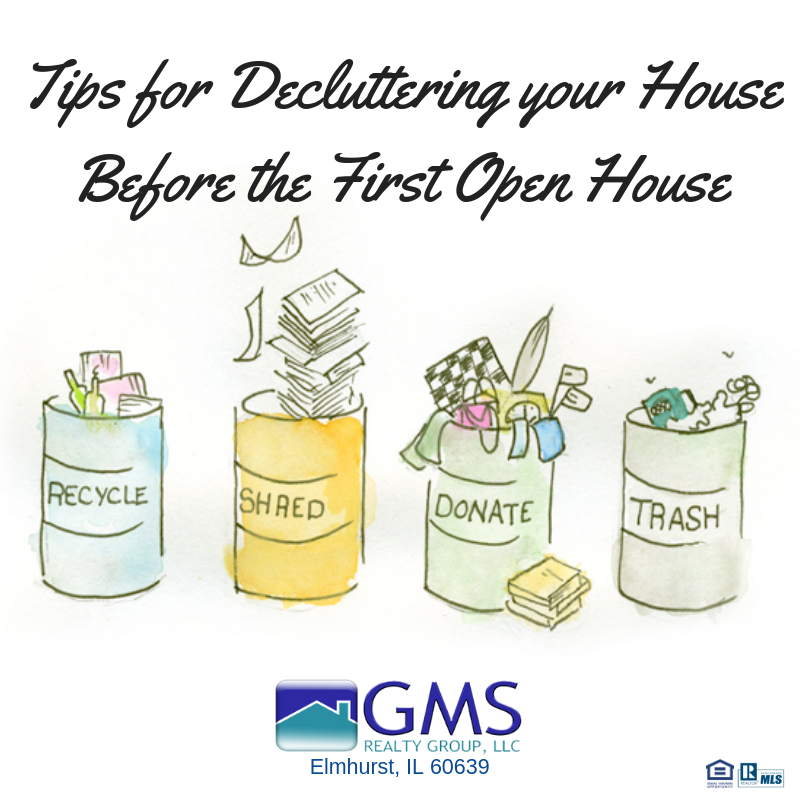 Sorting through the mess can take a considerable amount of time, so if you’re stuck here, place the cards or puzzling paperwork in a folder or storage box and hide it away for another day. Within the span of 2-3 days, you’ve organized your home before the big open house. All you need to do now is take your donations to the thrift store, do a little cleaning of any dirty spots, vacuum, and get ready for the offers to roll right in.